Last night we moseyed (in tons of traffic) on over to Mountain View's Books, Inc. for a Soul Pancake book signing and reading. My own Soul Pancake book came my way recently as a birthday present from my sister. We've been fans of one of the book's content co-director, Golriz Lucina, ever since we came across her awesomely adorable wedding video from Green Wedding Shoes. It not only brought us to tears (true love always moves me) but took us on a DIY-creatively-inspired-crafting spree that hasn't stopped since. 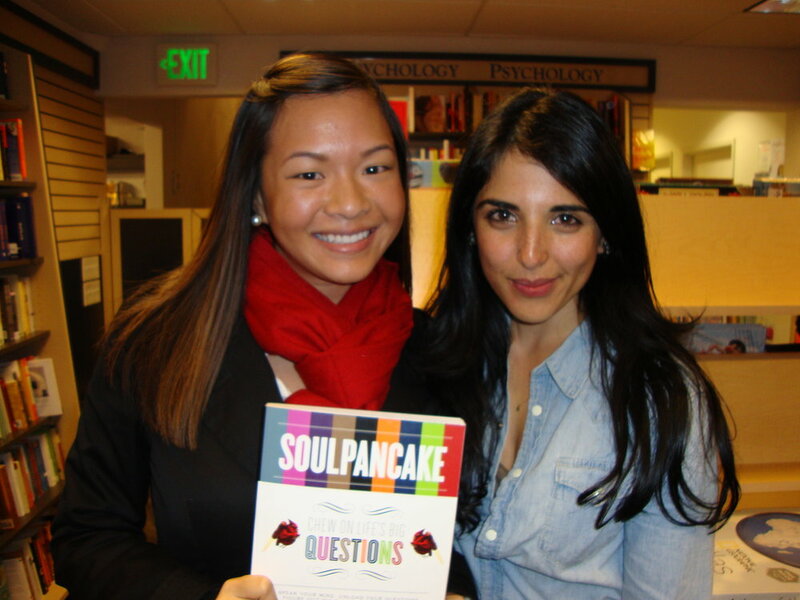 Anyway, when I read that the Soul Pancake peeps were going to be right here in the Bay Area, we were stoked! Not only did we get to meet the hilarious and brilliant Rainn Wilson, but also Golriz (and Devon) who's blog and thoughts and creativity is an inspiration for my own blog and thoughts and creativity. By the way, the Soul Pancake authors were everything I imagined them to be: eccentric, friendly, personable, and beautiful! Oh, and the Soul Pancake book (not to be forgotten) is also beautiful and eccentric and I can't wait to chew on life's big questions. Bringing back the soap bar.